Food that’s fried in oil is absolutely delicious, but it’ll also kill you. Food that’s “fried” in air is decidedly less delicious, but it’s still pretty damn tasty and it won’t kill you like real fried food. 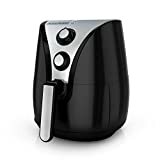 Devices like the BLACK+DECKER Purify 2-Liter Air Fryer use convection to cook up crispy food without any oil, and this particular model is so good that it earned a coveted “Amazon’s Choice” designation. It retails for $150 and Amazon typically sells it for just under $100, but you can snag it today on Amazon for only $50.